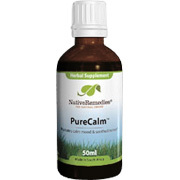 Non-addictive, immediate relief from symptoms of anxiety, stress, irritability, nervous tension, restlessness, panic attacks without side effects of prescription drugs. Adults: Take 10-20 drops in a little water or juice three times daily. Children: Take 1 drop per year of age in a little water or juice three times daily. Lemon Balm, Lavender, Passion Flower. How long does a bottle last: One bottle will last approximately one month. PureCalm Tincture is shipped in a discrete, unmarked package. Orders are processed immediately and usually take about 3 to 5 working days to be received. We do ask that you try it for 2 to 3 weeks to feel the full effects. Any information received is used only for order processing and shipping purposes. Your information, such as e-mail address, will never be disclosed to a third party.